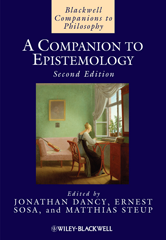 With many entries on key concepts, review essays on central issues, and self-profiles by leading scholars, this companion is the most comprehensive and up-to-date single volume reference guide to epistemology. Epistemology from A-Z is comprised of articles on important epistemological concepts that have been extensively revised to bring the volume up-to-date, with many new and re-written entries reflecting developments in the field. "We Are (Almost) All Externalists Now"